The Kid Who Would Be King is an exceptional family film based on the Arthurian legend. The rousing fable of Excalibur, the mythical sword in the stone, and the gallant Knights of the Round Table gets a pertinent update for modern times. Director/writer Joe Cornish, who previously made the near classic sci-fi adventure Attack the Block, returns to form. 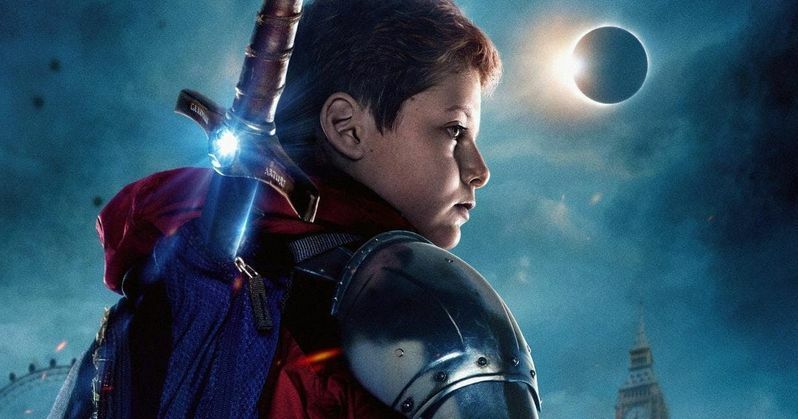 The Kid Who Would Be King has big budget special effects, swashbuckling sword fights, and clever humor; but truly stands out as a morality play. The story begins in an English suburb. Louis Ashbourne Serkis stars as Alex, a seemingly average twelve-year-old boy who lives with a doting single mother (Denise Gough). He's constantly defending his best friend, Bedders (Dean Chaumoo), from the merciless bullying of the older Lance (Tom Taylor) and Kay (Rhianna Doris). The torment causes Alex to question the cruelty and ugliness in the world. One fateful night he's chased into an abandoned construction site. He finds an old sword embedded in a rock pile. Alex removes the sword and kick-starts a chain of apocalyptic events. The evil Morgana (Rebecca Ferguson) has awakened in her prison, deep inside the earth. She has heard the call of Excalibur. Her undead armies rise to capture the sword. Alex and Bedders are stunned when a new schoolmate (Angus Imrie) claims to be the mythical wizard, Merlin. Whoever wields Excalibur is the true King of England, and must defeat the dark forces of Morgana. Alex has to be courageous, pure of heart, and chivalrous. He needs to turn enemies into allies, and raise his own army of good. But can Alex overcome his own deep misgivings to embark on such a dangerous quest? Joe Cornish has found a budding star in his young lead. Louis Ashbourne Serkis, the son of motion capture icon Andy Serkis and actress Lorraine Ashbourne, is brilliant in this role. Alex faces a realistic crisis outside of the fantasy elements. Abandoned by his father, Alex tries to explain his absence with the appearance of the sword. He takes his mother for granted, forgetting all the sacrifices that were made for him. This subplot in Cornish's script has real emotional weight. Coupled with the trials and tribulations of adolescence, Alex's growth as a person fuels his journey as the hero. Joe Cornish achieved the same dynamic with John Boyega in Attack the Block. A teen who was a petty criminal and gang leader emerges as heroic when the poop hits the fan. Cornish has tremendous skill in finding the right talent, and giving that actor the material to shine. The Code of Chivalry is a vital aspect of the film. Along with Alex, the supporting schoolmates must overcome their flaws to be worthy of knighthood. Again Joe Cornish deserves top marks for his script. The bullies are prime examples of the callous youth today. Selfish, greedy, and unrepentantly violent, the ugliness of their actions is addressed head on. Lance and Kay get their moments of reflection. The idea that people can put aside their differences for the common good is well realized. Cornish never gets preachy or heavy handed. He uses the peril of their situation to bring out the best in each character. The Kid Who Would Be King goes somewhat overboard in the finale. The film turns into an action spectacle. It loses earlier nuance with a blizzard of teens in armor battling CGI adversaries. It's a Harry Potter-esque turn that's too generic for such a thoughtful story. The Kid Who Would Be King is another feather in the cap of Joe Cornish. He's a proven talent working with children. Patrick Stewart and Angus Imrie nearly steal the show as the old and young Merlin. Their magical shenanigans add the perfect dose of humor. Grab the family and see this film. The Kid Who Would Be King is distributed by 20th Century Fox.